Tampax Compak tampons offer protection and discretion during your period. Retractable plastic applicator for easy tampon insertion. Protective Skirt to help avoid leaks before they happen. Absorption channels that pull liquid inside the tampon. Independently tested for harmful substances by Oeko-Tex. Gynaecologically tested. Free from fragrances and dyes. For more information about our products please visit our website. 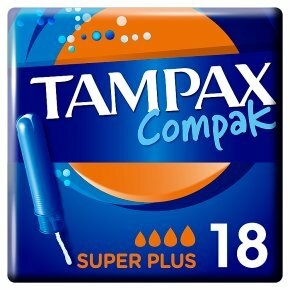 Tampax Compak Super Plus tampons offer protection and discretion for heavy flow days during your period. They are free from fragrances and dyes. Tampax Compak tampons come with a compact and discreet plastic applicator and a rounded tip for comfortable insertion. With absorption channels to absorb directly to the core and a protective skirt to help prevent leaks for a worry free period. Tampax Compak tampons have been gynaecologically tested. They have also been independently tested for harmful substances by Oeko-Tex. Trusted leak free protection to let you do whatever you like. Tampax Compak?s best tampons for heavy flow absorbency. Try Tampax Pearl Compak, our best protection across the Tampax line up. For more information about our products please visit our website. Tampons are associated with Toxic Shock Syndrome (TSS). TSS is a rare but serious illness that may be fatal. Read and save the enclosed information.